Lynda.com App Data & Review - Education - Apps Rankings! 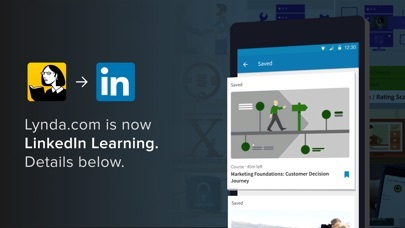 The applications Lynda.com was published in the category Education on 2010-02-25 and was developed by LinkedIn Corporation. The file size is 77.72 MB. The current version is 4.9.8 and works well on 8.1 and high ios versions. Do you like Lynda.com applications? Please share! 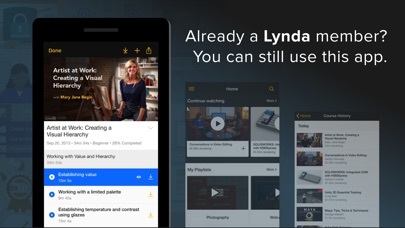 Learning something new every day is possible with Lynda.com. The breadth of topics available is enormous. I love using the exercise files so that you can try out what you are learning at the same time. Learn what you want when you want all from top-level instructors in clear and concise terms. Excellent value and great content. I absolutely love Linda.com. Thank you so much for this service. I can login on the desktop or on my phone but through the app, it seems to not work. I use my school email that works normally but the app keeps saying wrong user or password. Even after I clicked forgot my password and changed it, it still didn’t allow me to login. This service is great. I'm learning about almost any skill I want. It's great that it's tied into your LinkedIn and you can show off all the certificates you earn. 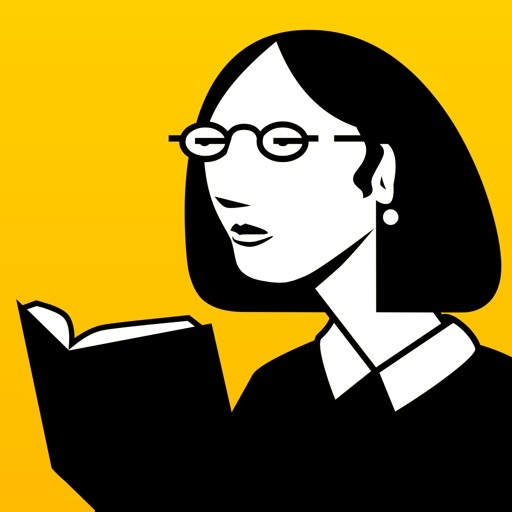 • Lynda was an independent JUGGERNAUT OF RESOURCES. That must have been a huge check to acquire Lynda. • Vital, key resources job hunters need are being absorbed into LI’s massive umbrella. • Lynda offers valuable free portions of their content; or full content (for a fee of course). • Lynda’s instructors and VERY GOOD. Customer Service is responsive and human. • And they keep an accurate record of what you have done; so you can revisit past lessons or pick up where you stopped in the past. My experience with Lynda has been really good (and there was not ever any “upsell” or “additional fees” for any of their resources). AND THEY DON’T BOMBARD, DISTRACT, or SLAP INTRUSIVE ADS IN YOUR FACE! Even downloadable lesson files are included in membership. Highly advise at least checking out the free offerings they provide. I even developed some favorite instructors! I love this app! Great current content for social marketers. Being able to cast to your tv is a plus. Keep the valuable updates coming. One of the best learning precinct in town. The play speed setting is not very useful, can’t set 1.1. The options 1.25 is too fast for most videos. Seriously, what’s the point of putting out an app when the videos aren’t even playable? Just here for us to give you one star comments huh? Asked me to start a FREE trial then immediately charged me $7.99 for my 1 month “FREE” trial... including the $54.99 that I will be charged at the end of the month. Talk about hidden charges. What a shady way to take money from already poor students. Contacting help & support & getting my money back. 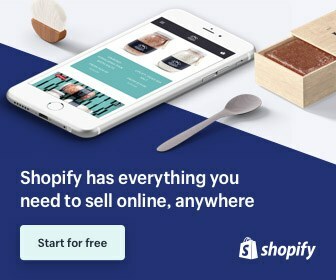 Refuse to be scammed by an app. Great courses. Have access through our local library! Great to see my tax dollars at work ;) The app works well especially like the speed increase option. If your comfortable with the price, this is one of the best, video training apps around. I have been using this app off and on for several years. The training videos are very detailed, and they are good about adding current content. The paid subscription comes with exercise files if applicable. Highly recommend. Can’t use without LinkedIn. No longer interested. Cancelling this month. Shame on you. Way too expensive! difficult to log on and difficult to cancel subscription. Cannot rate less than one star!!!! Does not allow you to login. The only option provided is to link my linkedin account which has a different email address. It doesn’t recognize it. I can login on my desktop machine using the same credentials with no problem. Fix this Lynda! The training videos are fantastic. The app to access the videos is terrible. I have a pricey monthly subscription through Linked In. The app does not allow me to sign in via my Linked In account and has broken links when trying to fix. It also can not link my previous stand alone Lynda account with Linked In. I do not have hours to spend to get things working with the lack of direct support available. So my pricey monthly subscription has been a complete waste of money. For those of us using library Lynda accounts, please make your library card login page mobile friendly. I’d give it 5 stars then. Sell outs be damned! Cancelled today. Replace with Udemy. 🤞🏻hope they don’t sell out too. Have an account which works fine on my computer but will not open on the app. 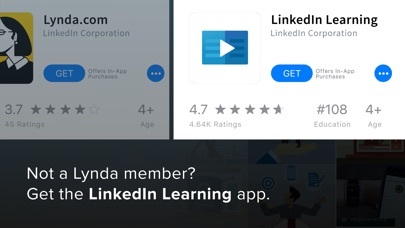 Even after successfully signing into LinkedIn through the Lynda app it still keeps asking for a sign in.